Itching "down there" can drive any woman crazy. "Down there" is the vulvovaginal area and anything from wearing tight clothing, to a vaginal infection like trichomoniasis can cause uncomfortable, even painful itching. Having an itch is not about being dirty or having poor hygiene, as there are many common causes for it. 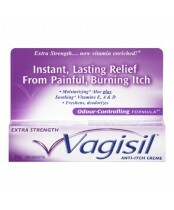 Vagisil, has provided feminine health solutions to women for 40 years. As the expert in feminine health, Vagisil develops innovative therapeutic and daily care products designed to relieve vaginal discomfort and promote everyday confidence.